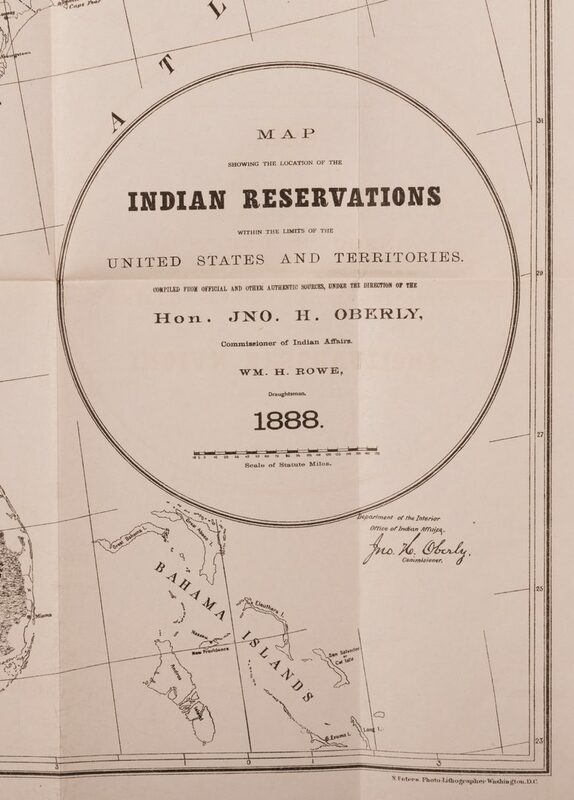 1st item: "Map Showing the Location of the Indian Reservations Within the Limits of the United States and Territories" compiled from the Official and other Authentic Sources, under the Direction of the Honorable John H. Oberly, Commissioner of Indian Affairs. 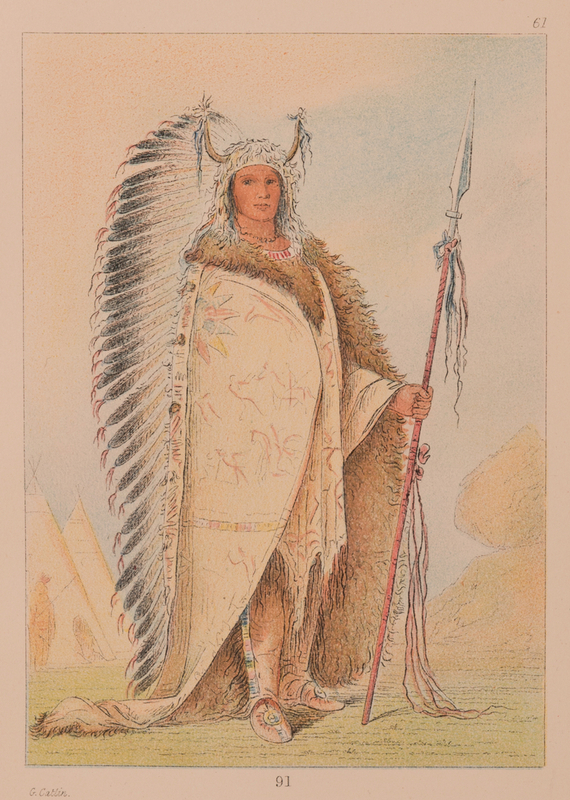 William H. Rowe, Draughtsman, photo lithographed with printed color by Norris Peters, published by Office of Indian Affairs, Washington, D.C., 1888. Issued with the Annual Report of the Department of the Interior. Map depicting the United States, detailing the locations in color of Native American reservations such as the "Indian Territory" of the Cherokee, Creek, Chotaw, etc. 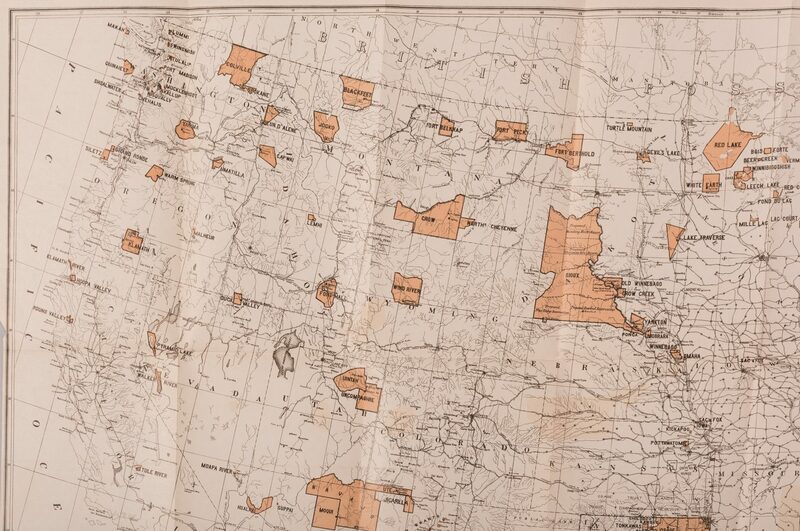 in what would become the state of Oklahoma. 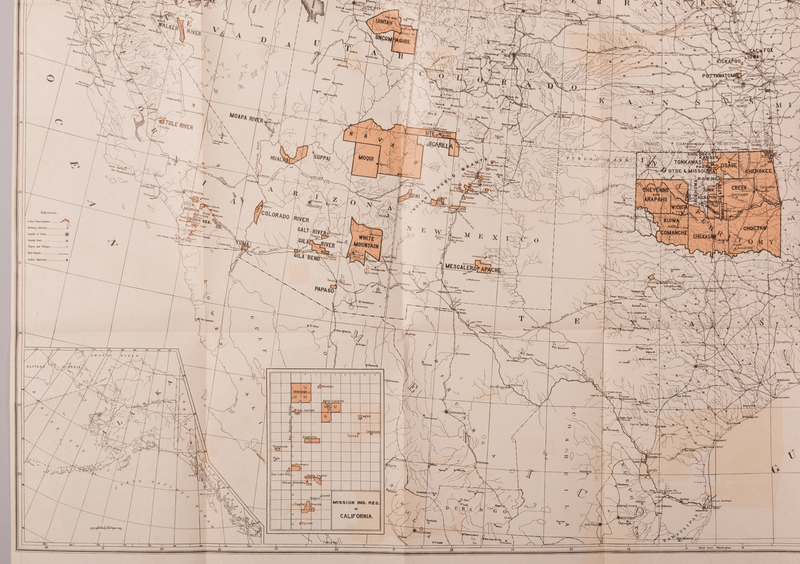 Includes inset maps of "Indian Territory" lower center, "Mission Ind. Res. in California" and "Alaska", lower left. Title and scale of statue miles, lower right, references, left center. "West from Greenwich", centered above map, "West from Washington", centered below map. Map surrounded by scale notations and triple line border. Image – 20 3/4" H x 32 3/4" W. Sheet – 22 1/2" H x 34" W. 2nd item: "U. 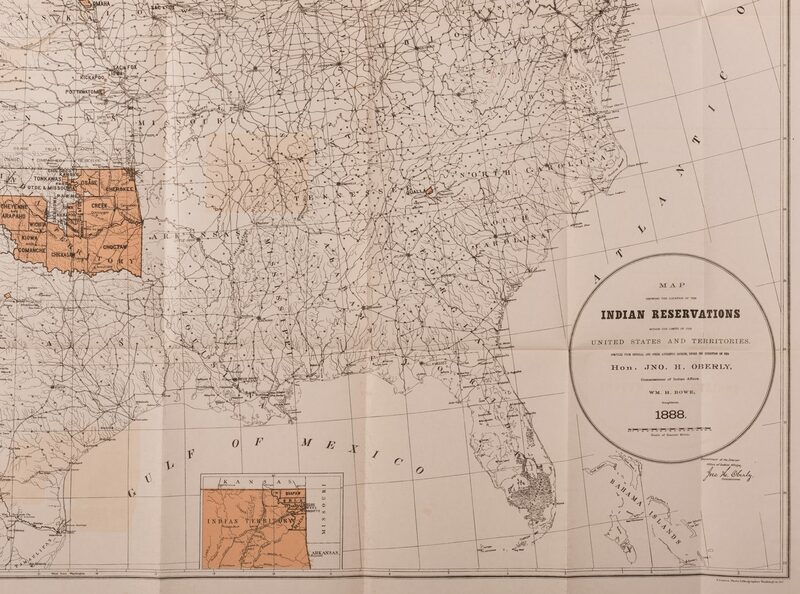 States Indian Frontier in 1840" Map, by George Catlin, lithographed with printed color by Tosswill and Company, published for the Domestic Committee of the Board of Missions by Daniel Dana, Jr., New York, 1844. 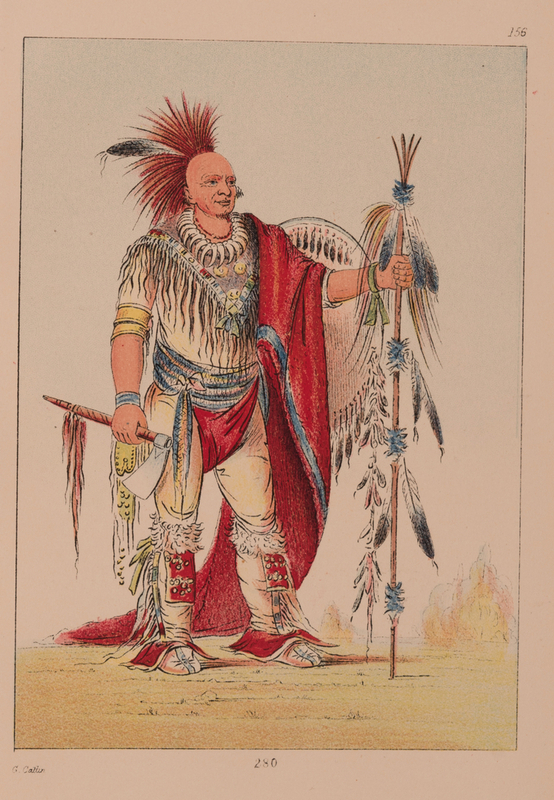 From "Journal of a Tour in the "Indian Territory"." by Nathaniel Sayre Harris; Episcopal Church . Board of Missions. Domestic Committee. 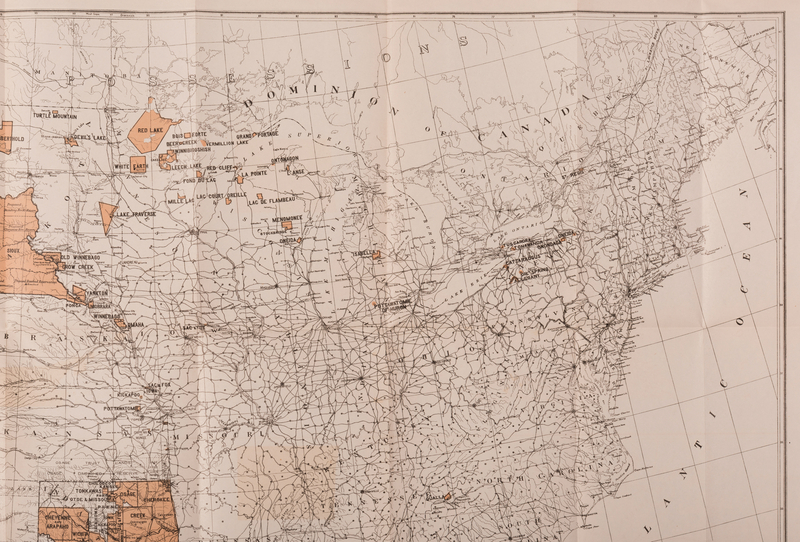 Map depicting the locations in color of the Native American tribes that had been moved west of the Mississippi River as of 1840 including the Sacs and Foxes, Kickapoo, Delawares, etc., and the surrounding states. 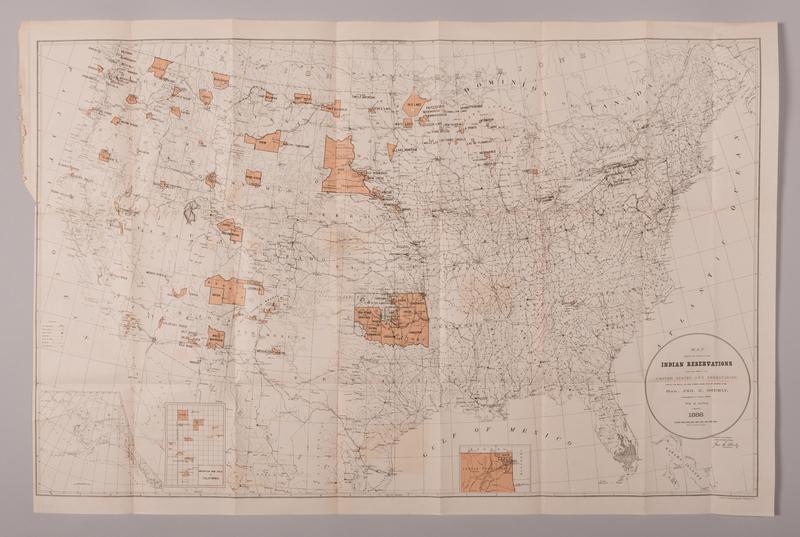 Uncolored territories of the Chippeways, Sioux, Crows, etc., Texas and Mexico surround colored areas. Map surrounded by notations and line border. 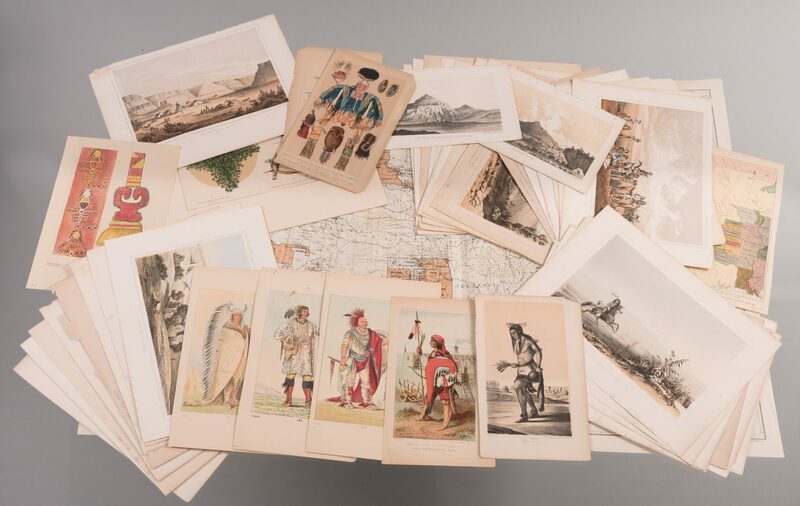 Image – 8 1/2" H x 5 1/8" W. Sheet – 9 3/4" H x 6" W. 3rd-29th items: 27 lithographs, most with hand coloring, from the "Report of the United States Pacific Railroad Expedition and Surveys (USPRR) CAL (Senate Document: Reports of Explorations and Surveys to Ascertain the Most Practicable and Economical Route for a Railroad from the Mississippi River to the Pacific Ocean)", circa 1855. 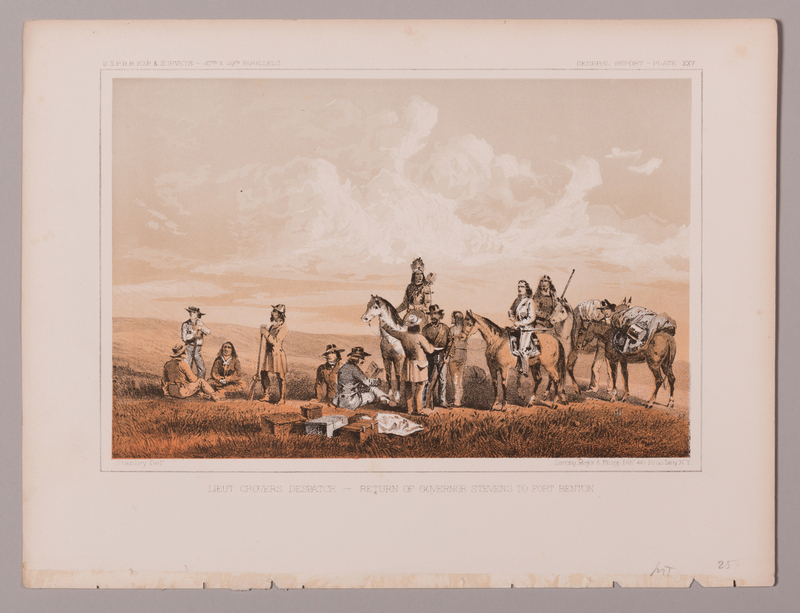 The prints feature scenic views from the American West including "The Great Basin from the Canada de Las Uvas with Lost Mountains in the Distance", drawn by Charles Koppel, lithographed by August Hoen and Company, Baltimore, images of Native Americans such as "Distribution of Goods to the Assiniboines", drawn by John M. Stanley, lithographed by Sarony, Major and Knapp, New York, and U.S. Military bases including "U. S. Military Post Benicia". 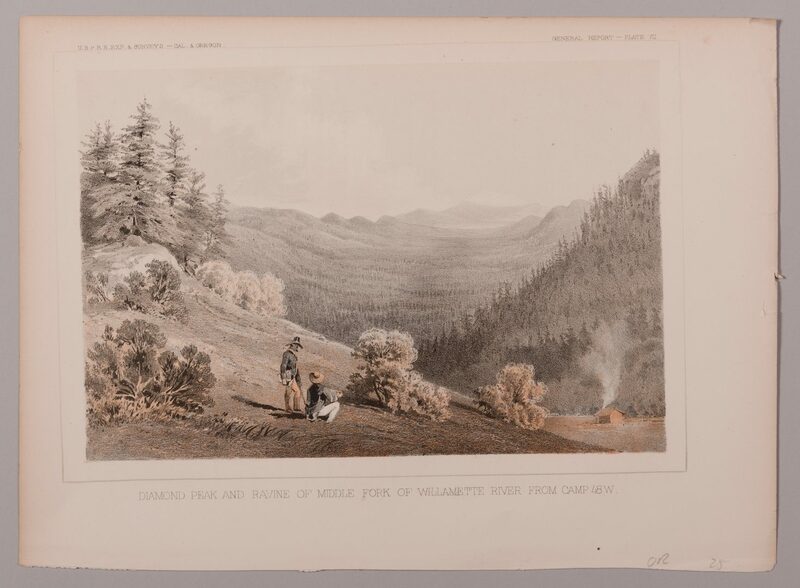 "Near Mouse River" print housed in plastic sleeve. 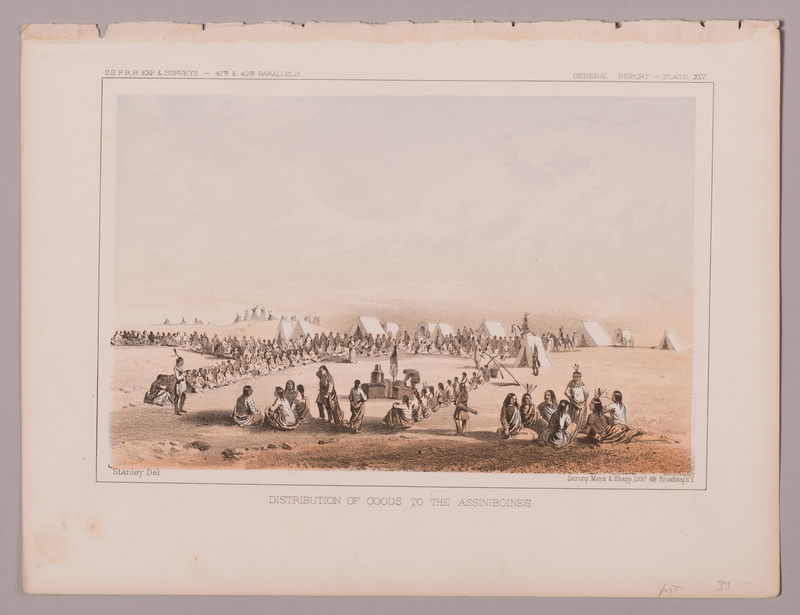 Images approximately – 6 1/8" H x 9 1/4" W. Sheets approximately – 8 1/2" H x 11 1/2" W. 30th-34th items: 4 tinted lithographs from "Report of an Expedition Down the Zuni and Colorado Rivers", by Captain Lorenzo Sitgreaves, Corps of Topographical Engineers, circa 1854. 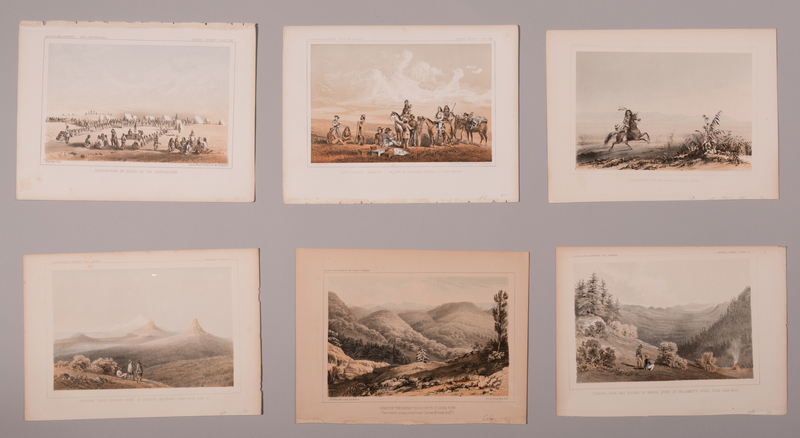 Titles include "Zuni Indian [Buffalo Dance]" and "Canon Peak from Camp 7", both drawn by Richard H. Kern, lithographed by the Ackerman Firm, New York, "View Near Gypsum Bluffs on Red-River" and "Mount Webster", both lithographed by Henry Lawrence, New York. 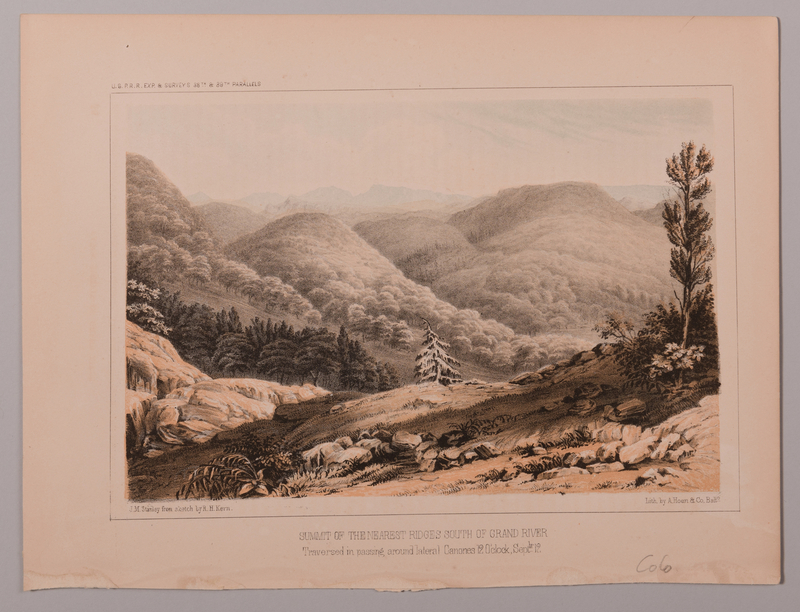 Images approximately – 3 7/8" H x 7" W. Sheets approximately – 5 7/8" H x 8 3/4" W. 35th-38th items: 3 tinted lithographs from United States Geological Surveys (USGS), including "Mt. 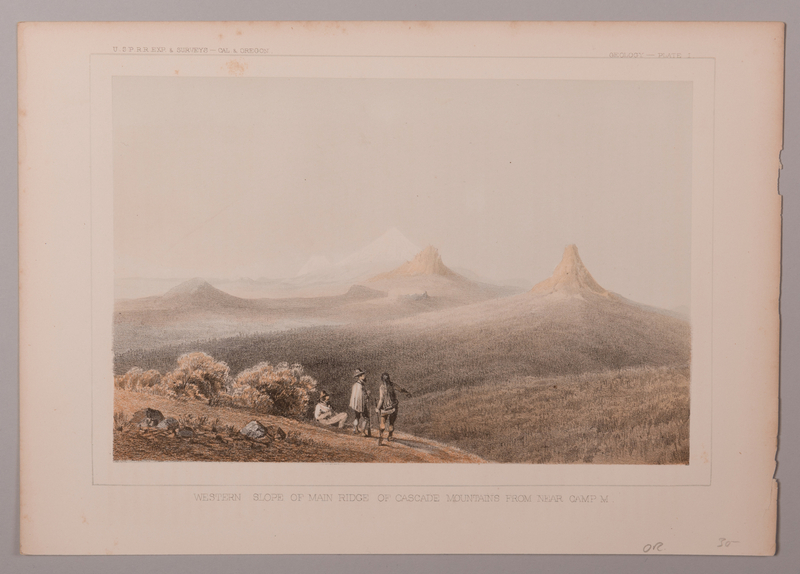 Agassiz – Unita Range – Utah" and "Eocene Bluffs -Green River – Wyoming" from the "Geological Exploration of the Fortieth Parallel", circa 1870-1880, and "Bullion Ravine Looking East. Diorite. Mt. Kate in the Middle Distance" from "Geology of the Comstock Lode and the Washoe District, with Atlas, USGS Monograph", by G. F. Becker, 1882. 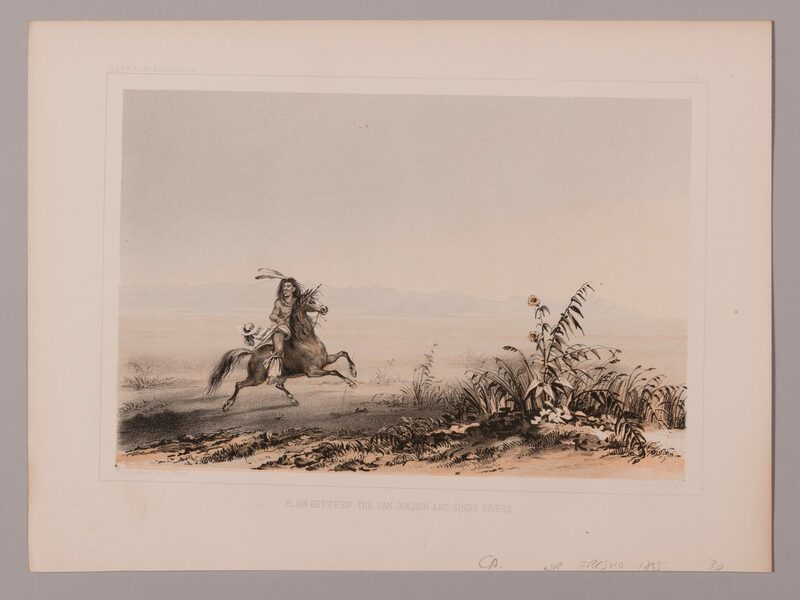 Images approximately – 9" H x 6 1/4" W. Sheets approximately – 12" H x 9 1/4" W. 39th-46th items: Assorted grouping of Native American colored lithographs, including "Hos-ta, (The Lightning.) 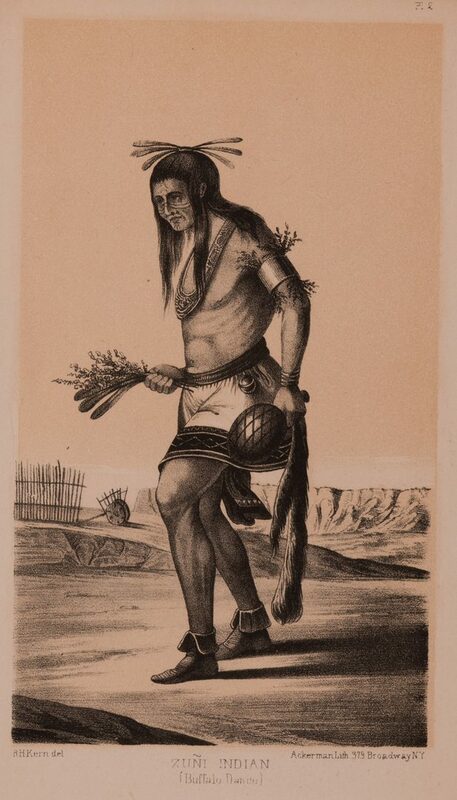 Governor of the Pueblo of Jemez. Aug. 20", illustrated for United States Executive Documents. 31rst Cong., 1st sess., 1849-1850, drawn by Richard H. Kern, lithographed by Peter S. Duval, Philadelphia, circa 1894, "PL. 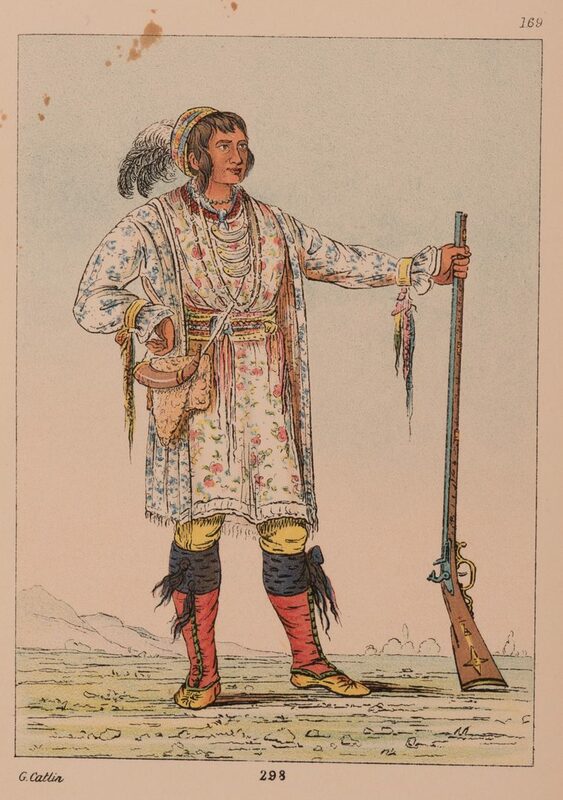 CXVII" from the Bureau of Ethnology Eigth Annual Report, 1892, "Sioux War Shirt, Apache Caps, Pouches, Moccasins, Totems, &c." with "Description and Explanation of Plate II" text page, published by A. D. Worthington and Company, Hartford, "Lamina XCIII T. IX. 24. Tejidos. ", and "91", "286", and "291", by George Caitlin. "Hosta" housed in plastic sleeve. "PL. CXVIII" mounted to matte. 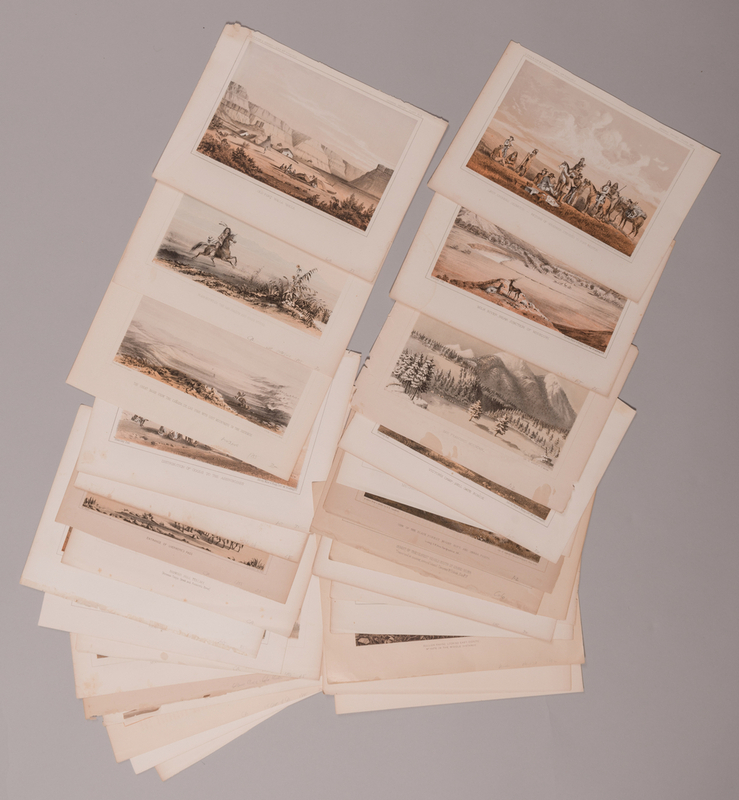 Images range in size from 6 3/4" H x 4" W to 5 1/2" H x 8" W. Sheets range in size from 8 7/8" H x 5 3/8" W to 7 1/2" H x 11 1/8" W. All items mid/late 19th century. Provenance: Collection of Charles and Ann Wells, Nashville, Tennessee. CONDITION: 1st item: Toning impressions from colored areas on surface of map. Minute black scuffs along lower right paper crease. 15" section of left edge of map cut away, paper tears, top left edge of sheet. Toning impressions visible en verso. 2nd item: Minute toning spots across top of sheet. Toning spots visible en verso. 3rd-29th items: Light overall toning, foxing spots, and water damage. 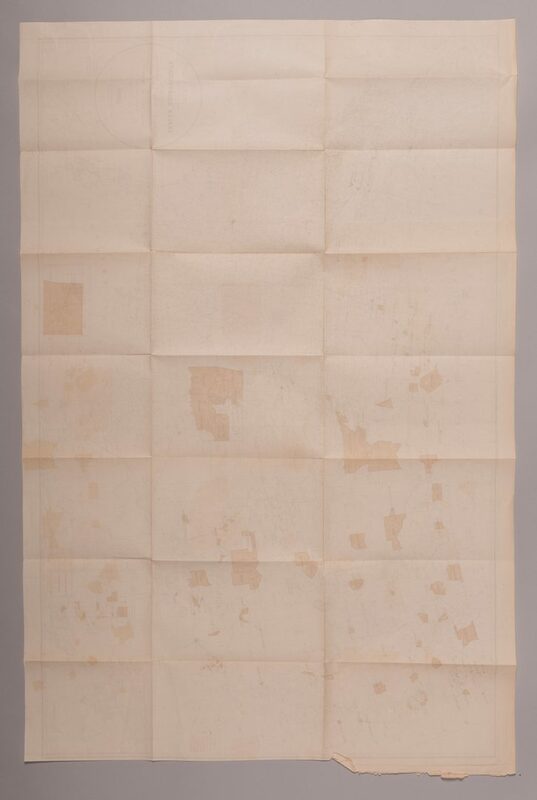 Several sheets with rough edges from book removal. Two pieces of white tape, top left and right of "Butte de Morale" print. 30th-34th items: Light overall toning and foxing spots. "Canon Peak" with rough top edge from book removal. 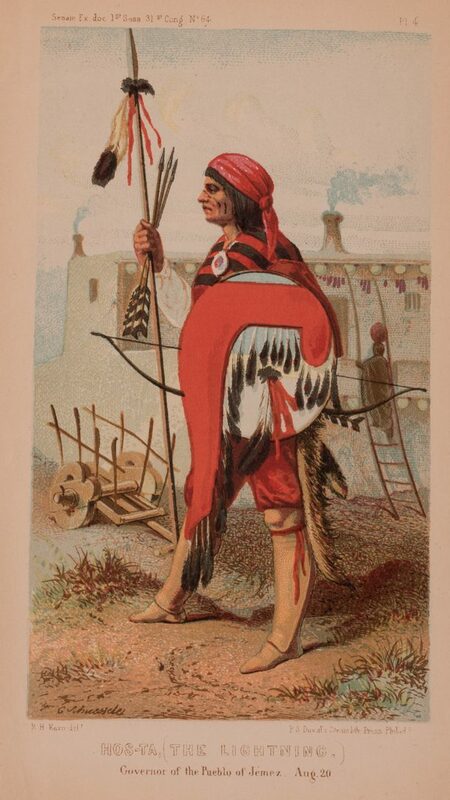 "Zuni Indian" with piece of scotch tape, top left corner, and paper tear, top right corner. 35th-38th items: Light overall toning. 39th-46th items: Light overall toning. Foxing spots, largest 1/4", top left of "298".